The fake site is impersonating another delivery company. The domain got deleted, and now is back online. SBHsafetylink concentrates on providing high quality logistics services to technology industries, focusing on global clients in capital equipment and device manufacturing. Customers include chip manufacturers, government, universities, research & development labs, equipment makers, asset managers, and after-market refurbishers. The company was founded in 2000, and has expanded to manage projects in factory buildups and relocations. We are driven and motivated by the sophisticated needs of our customers. SBHsafetylink Logistics since 2000 has safely moved many million dollar state-of-the-art machines to/from North America, Asia, and Europe. Our clients include semiconductor fabs, OEMs, universities and research institutions, refurbishers and brokers of used equipment, asset management companies, and the United States departments of Defense, Energy, and Commerce. According to the fake site details - http://db.aa419.org/fakebanksview.php?key=103449 - the previous "incarnation" was created in 2015. The fake site is impersonating Australian Military Bank - the scammer was stealing not only the content of the real site, but even the real bank phone number used for contact. We’ve been helping Australian Defence personnel and their families make the most of their money since 1959. As Australia’s longest serving Defence financial institution, we know a thing or two about the unique aspects of life in the armed services. Another fake site used in non-delivery scams, pretending to be Tranxnet Solutions. The content of the site was stolen from a real company site, active in the UK. According to the fake site details - http://db.aa419.org/fakebanksview.php?key=116140, the domain was created on September 2015. Boer goats,Rams, Sheeps, Ewes, Heiffers, Angus, Brahmans and other cattle species for sale a.
Cape Agro Farms is a growing operation in Beaufort West, In the western Cape Of South Africa. Our farm will typically have between 300-500 head of goats, with kids born throughout the year. Our primary focus is breeding purebred South African Boers, Nguni Cows but we have recently began breeding purebred Nubians , Dorpers & Rams, Oberhasli Goats as well the Brahman, Bonsmara cattle and the Angus keeping a large number of these breeds. We also keep a handful of other dairy breeds as a hobby and to show. Thank you for visiting the Cape Agro Farm of South Africa Webpage! Please do not hesitate to contact us should you have any queries. Fake delivery company used in romance scam. The scammer claims to be military personnel in a war area. After romancing the victim, the scammer claims he/she will be sending a parcel to that victim. The scammer pretends there is money in the parcel and later the customs will find about it - the victim will be asked to pay fees for releasing the parcel. There is no parcel and there is no money in the parcel - the only money involved are the ones the victims will lose. Our air freight department has many years of experience in expediting all types of commodities and can fly your goods to any location quickly and cost effectively utilizing proven air carriers. They claim having offices in various places - but there is no contact detail on the site. The fake site is a follow up of another fake site: standardtrustlineltd.com was active in 2015. I would like to ask how these two websites are the same. Which is true and which is false. I am a bit unclear. The other party gave me the tracking number and the website. Yesterday, I received a European diplomatic express call from this website saying that things are subject to customs duties at customs. The victim sent us two links: one to a real delivery company and a second one to a fake site who stole the content of the real company website and uses it under another name. The same stolen content was previously reported here with another fraudulent company pretending to be Fidelity Global Link and Delivery Services. The person sending the victim a link to the fake site for tracking a supposedly parcel sent to him is a fraudster. The scammers using that fake site are Nigerians. 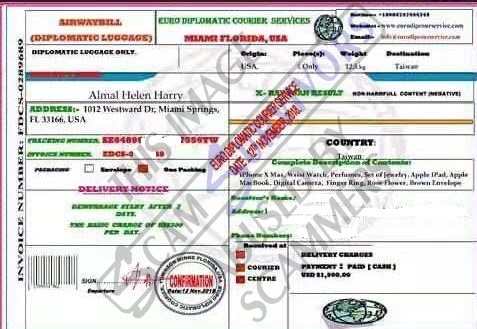 The sender claims to be Almal Helen Harry, 1012 Westward Dr., Miami Springs, Florida 33166, USA. Euro Diplomatic Courier Service is an integrator in the logistic industry, covering through a global network of agents , all the major centers of our globe. Accredited and licensed by the United Kingdom (Non Vessel Operating Common Carrier) and O.T.I. (Ocean Transportation Intermediary). Euro Diplomatic Courier Service is accredited and licensed by the USA to Canada, Europe Federal Maritime Commission as an NVOCC (Non Vessel Operating Common Carrier) and OTI (Ocean Transportation Intermediary). S.W. Bankers Hall – Suite 3900.